South Africa Elephant Back Safaris - following in the footsteps of the Ancients: Elephants, the largest land animals in the world, inspire a feeling of awe and respect in most people. Weighing up to 6 tons (11 000lb) and reaching speeds of up to 40km/hr, this monster of the animal kingdom has an impressive presence. Whilst the majority of people will never have the opportunity to come close or even touch these animals, many South African game reserves (SEE: www.sa-venues.com) offer the once in a lifetime chance to do an Elephant Back Safari. Imagine yourself, perched 6ft in the air on the back of a 6 ton elephant, slowly making your way through open velds or dense forests. It’s a safari like no other. As such, Elephant Back Safari’s in South Africa are growing in popularity. Game viewing on elephant back provides you with the unique opportunity of getting really close to wildlife (SEE: www.sa-venues.com/wildlife) that you could normally only view from far off. The smell of the elephants overpowers that of people so that other animals like rhino, giraffe and buck etc will not be scared off by the scent of people nearby. As such you’re able to get close up to extraordinary wildlife. An elephant back safari at most game reserves is usually a well catered for event including meals and of course, the elephant ride. 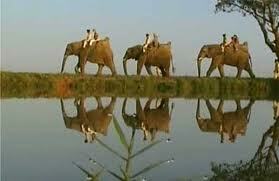 The elephants are prepared with a comfortable saddle and you’ll be seated behind an experienced elephant handler. An elephant back safari will usually last around an hour and 30 minutes. Granted, your initial few minutes on the back of this monstrous animal will be endured with more than a little apprehension, but rest assured that as the safari begins and you become accustomed to the rhythmic and calm movements of the elephant, the experience that follows will be incredible. Many game reserves in South Africa also provide the unique and enjoyable opportunity to walk along with the elephants as you move through the velds and forests. Being surrounded by these enormous animals and moving along with them during the safari is a sobering experience and one that is not easily forgotten. The elephant sanctuary near the Magaliesberg Mountains offers the opportunity of spending an entire day out with these animals and taking part in activities like elephant walks, elephant back safari rides, feeding and brushing the elephants and much more. A South African elephant back safari is a truly wonderful experience. Being immersed so deeply in nature and interacting with such powerful creatures is deeply rewarding and satisfying and is an opportunity that should not be missed.